Want to create studio-quality work and get noticed? Just coming off Flash and looking for a Toon Boom intro? Are you a traditional pencil-and-paper animator? From scene setup to the final render, learn how to navigate the Toon Boom interface to create animation that can be published on a variety of platforms and formats. Animate to Harmony guides you through Toon Boom’s Animate, Animate Pro and Harmony programs, teaching you how to create high-quality 2D animation of all complexities. The main text focuses onfeatures that are common across all three programs while "Advanced Techniques" boxes throughout the book elaborate on Pro and Harmony features, appealing to all levels of experience with any of the three main Toon Boom products. 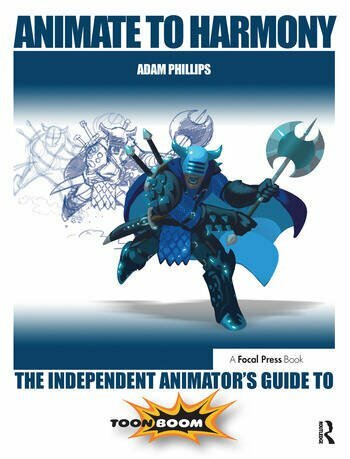 Working out of the Blue Mountains in New South Wales, Australia, Adam Phillips is an independent animation professional, creator of the Brackenwood series, and publisher of Bitey Castle. Through his website, bitey.com, Adam hosts tutorials and courses in animation, 2D special FX, Flash, and Toon Boom animation software. Adam worked as an animator and effects supervisor with DisneyToon Studios, Australia for eleven years before going independent to concentrate on his popular internet series, Brackenwood. Independent now for over a decade, his showreel spans a huge range of personal and professional projects including illustrations, comics, short stories, album covers, music videos, animation and game cinematics, for clients such as Ween, Kellogg’s, Riot Games, BioWare San Francisco, Rumble Games (KingsRoad), Wizards of the Coast (Dungeons and Dragons), and Bento Box (Bob’s Burgers).